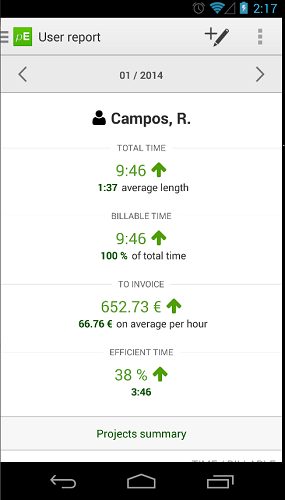 It provides a monthly report which includes personal performance, a summary by project, activity and client, allowing you to review the total worked hours and the money earned. You can also slide to the left or right to see the data for the previous or following month. You can open it from the slide-out menu, just slide from the left or click in the top-left icon, and select the option Personal report.